The 11th Central European Symposium on Pharmaceutical Technology (CESPT 2016) was held on 22-24 September 2016 in Belgrade, Serbia. Organized by: Faculty of Pharmacy at University of Belgrade, the European Federation of Pharmaceutical Sciences (EUFEPS) and other pharmaceutical associations and communities with the support of leading manufacturers of analytical and technological equipment for pharmacy: Waters, BASF, Gamlen Tableting Ltd., Sirius Analytical, HARKE Pharma, Anton Paar, Sartorius, Donau Lab, Olympus, and others. A key goal of the CESPT Symposium Series is to foster intellectual exchange among members of the international pharmaceutical community. The symposium brought together about 300 researchers from academia, industry and regulatory authorities from more than 30 countries. There were 2 plenary lectures, 9 invited lectures, 25 oral and 121 poster presentations were at the Symposium. Ukrainian Scientific Pharmacopoeial Centre for Quality of Medicines took part in the Symposium. 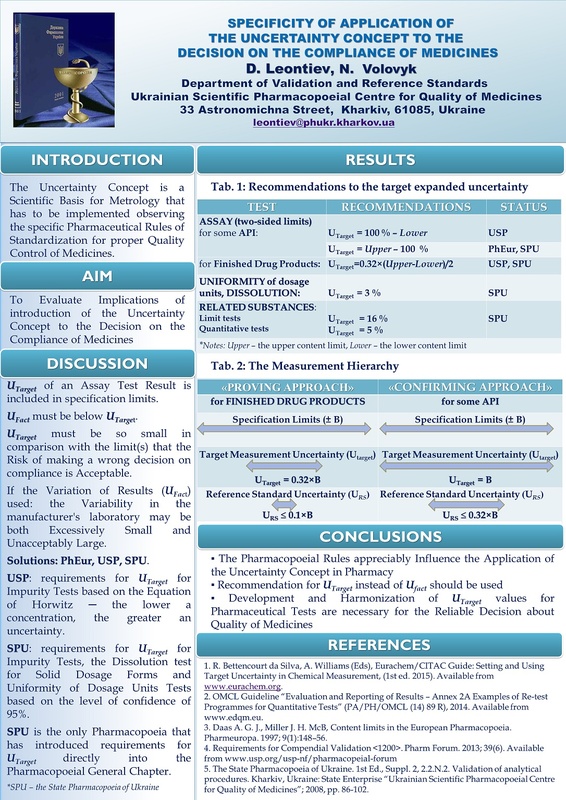 Dmytro Leontiev, D.Sc., Deputy Director of Science, Head of the Validation and Reference Standard Department, presented a poster Specificity of Application of the Uncertainty Concept to the Decision on the Compliance of Medicines (authors: D. Leontiev, N. Volovyk). 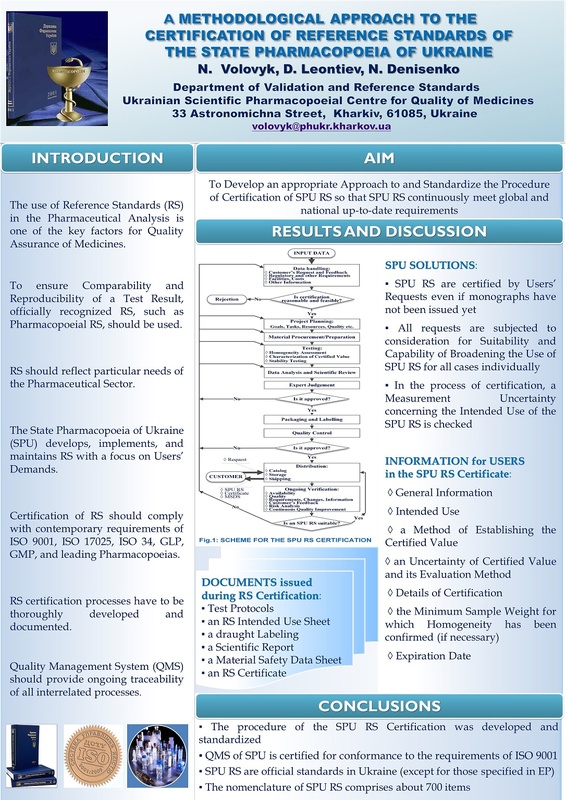 Natalia Volovyk, Ph.D., Deputy Head of the Validation and Reference Standard Department, presented a poster A Methodological Approach to the Certification of Reference Standards of the State Pharmacopoeia of Ukraine (authors: N. Volovyk, D. Leontiev, N. Denisenko).